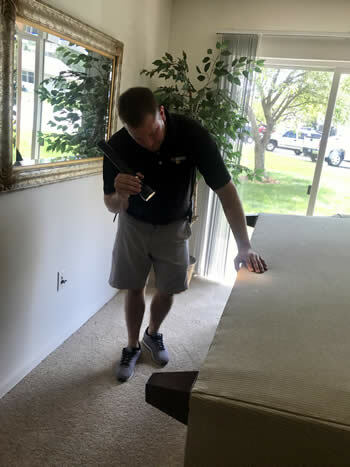 It’s possible to pick up bed bugs almost any place – they’ve infested offices, stores, hotels, gyms and countless other places we never would have imagined just 10 years ago. They can hide in your luggage, personal belongings, or even on you, and hitchhike a ride back to your home, condo, townhouse or apartment. Once indoors, they can be extremely difficult to eradicate without the help of an experienced pest control professional. A bed bug infestation has nothing to do with cleanliness – you can pick them up in even the finest hotels, and they can hitchhike into the cleanest homes at any time. But you can help reduce your chances of a costly bed bug infestation by catching them early. When traveling, think of the acronym SLEEP to remember the following action steps to help avoid taking bed bugs home with you. Inspect your residence regularly – after a move-in, a trip, a service worker comes in, or guests stay overnight. Limit use of secondhand items, always inspecting them carefully, and washing and cleaning donated items before using. Vacuum carpets and floors thoroughly, as well as baseboards, and dispose of vacuum bags promptly (if you have bed bugs, they will live inside bags). Wash floors regularly. Because bed bugs don’t tend to burrow under clothing, you may be able to avoid bites by wearing pajamas that cover as much skin as possible. Use mosquito netting. Some studies indicate that bed nets impregnated with the pesticide permethrin may help protect sleepers against bedbug bites. However, this practice may be helping bed bugs develop resistance to this pesticide. Insect repellents designed to protect against mosquitoes or ticks aren’t very effective against bed bugs.